The following members of Troop 33 have been awarded the rank of Eagle Scout, the highest rank attainable in Boy Scouts. The title of Eagle Scout is held for life, thus giving rise to the phrase "Once an Eagle, always an Eagle". 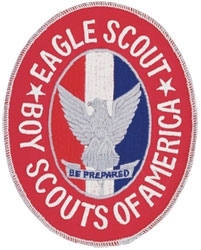 Read about Arthur Rose Eldred, BSA's First Eagle Scout.